I collect a lot of weird stuff, but even I have to admit that the spinthariscope might be one of the strangest. It’s brilliant in its simplicity. A tiny piece of radioactive thorium sits inside of a chamber. When an atom of thorium radioactively decays it shoots out an alpha particle which hits a zinc sulfide screen. This causes the screen to fluoresce for a split second. The flash is brief, but bright enough for the human eye to see as long as you are in the right conditions. You see, in order to watch this incredible light show you must be in a pitch black room for about 15 minutes in order to let your eyes adjust. But believe me, it is definitely worth the wait. There are thousands of thorium atoms decaying at any moment, leading to an incredible fireworks show. Besides the amazing fact that you are literally watching the results of individual atoms decay, it’s also quite beautiful. And don’t worry, modern spinthariscopes have been specially designed to be safe. As we enter the Christmas season it’s easy to get caught up in a whirlwind of materialism and an ever-increasing number of events. It seems like every day and night is filled with a non-stop marathon of activities. It has become increasingly difficult to slow down and enjoy the season. But I believe that it has become increasingly important to do exactly that. In the case of the spinthariscope, slowing down and enjoying the moment rewards the viewer with a scene of incredible beauty – as though a thousand fireflies were dancing before you. But what exactly should we be watching for in this Christmas season? How about watching for tiny acts of kindness. Let me give you an example, when I was just a kid I suffered a pretty serious back injury. As part of my recovery I was put on bed rest. I have a seven-year old boy and I can’t imagine trying to keep him still. Anyway, as you can probably imagine this was a really difficult time for me. During one of my hardest times my Uncle Scott showed up with a surprise gift – an awesome remote-controlled car. I loved that car. It had huge off-road tires and I could drive it over anything that got in its path. Even though I was stuck on the couch the car could go all over the living room, dining room and kitchen. If I was lucky I could even drive it into one of the bedrooms at the end of the hall, but since I couldn’t see into the rooms it was tricky to navigate it back. Everyone wanted to play with the car and I it helped drag me away from my feelings of self pity. A few weeks ago my Uncle Scott came to town and we had the chance to go out to dinner with him. I didn’t bring up the RC car and I’m sure he wouldn’t remember it if I did. It was just a tiny act for him, but it was an amazing act of service for me and I will always be grateful for it. Our lives are filled with these tiny acts of kindness, sometimes performed by us and oftentimes performed by others. But as we slow down and allow our eyes to adjust we are better able to observe these acts – and they can fill our lives with wonder. Recently we had a great family home evening activity. My son was the one who came up with the idea. 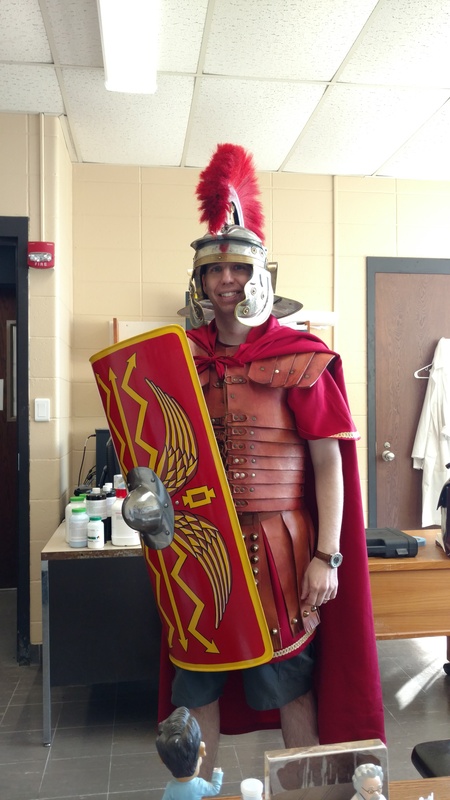 He was really excited to dress up in some Roman armor so he decided that we should have a lesson on putting on the whole armor of God (Ephesians 6:11-17). One thing that struck me was how seriously he took the topic (as you can see in the photo above). He really wanted to share his thoughts with the family and wanted everyone to pay attention. Before his lesson we spent quite a bit of time trying to get the armor to fit just right on his small body. I really began to think about how he couldn’t do this alone. He wanted to wear the armor, but he needed me as his parent to help him to put it on. But infinitely more importantly, we’ve been trying as a family to put on the whole armor of God and wear it at all times. As a kid one of my favorite activities was to visit the local planetarium. Not only did they have the greatest activities and star shows, they also had astronaut ice cream – that dehydrated block of tasty goodness. I remember wanting to be an astronaut just so that I could eat that tasty treat while floating around in space. I remember as a teenager I once turned down a free pair of box seat tickets to a Utah Jazz playoff game because I didn’t want to miss the members-only preview of the new laser show at the planetarium. Looking back I see that as much as I enjoyed the planetarium, it was really just a great excuse to spend time with my family. My parents were always great about spending family time as well as one-on-one time with each of us kids. Now that I’m a parent my wife and I try to do the same thing. Sometimes our activities are silly, like putting on swim suits and playing out in the summer rain, and sometimes they are a bit more serious, like yesterday when I took my son to help stack wood with a group of young men. It doesn’t seem to matter what we do, my kids just love spending time together. A few weeks ago my youngest daughter and I decided to hang out together. She has been doing a great job at school as well as at home, so we decided to do something special – ice cream. And not just any ice cream, we decided to conquer the Dog Dish Challenge at our local ice cream parlor. Imagine a huge metal dog dish with 10 scoops of ice cream and 5 toppings, covered in whipped cream. It took us almost an hour, and it was a bit painful, but we did it. I think the happy memories we made were worth the extra pounds I’ve added on – but next time I’m going to stick with the less-filling astronaut ice cream. As a kid, I loved Choose Your Own Adventure books. I loved the idea that not only could I read the story, but I could affect the story by the choices I made. I used to carefully place bookmarks whenever there was a fork in the story so that I could go back and take each path. I always wanted to know what would have happened if I had made a different choice. Recently I had the amazing opportunity to spend a month in Florence, Italy teaching a study abroad course. My family was able to join me and we had an incredible time. There was so much art, history, and science to experience… not to mention so much gelato to eat. During our last week we came across an engraved paving stone with the words, “Every step I have taken in my life has led me here, now.” That phrase has stuck with me. It seems that far too often in my life I have become stuck in the “What if…” loop. I second guess various decisions in my life and wonder what would have happened if I had taken a different path. It’s the same mentality I had as a child reading Choose Your Own Adventure books, but life doesn’t allow you the luxury of flipping back a few pages just to find out what would have happened. After seeing those words engraved in stone, I have tried to look at life a little differently. I regret mistakes I have made and people I have hurt, but when it comes to general life decisions I am trying to look forward, rather than behind. I have a wonderful life with so much to be thankful for. Each choice I have made has truly brought me to this point in life – and for that I am grateful. So rather than thinking about what might have been, I am trying to focus on what is to come. We’ve had a bit of a drought here in New England. There has been a lot of worry among farmers as well as the fear that wells will go dry. One (and probably the only one) benefit has been that I haven’t had to mow the lawn much this summer. I hate mowing the lawn. It’s hot, dirty, frustrating work – especially given our yard’s ability to grow rocks at a tremendous rate. The other day I decided that it was finally time to mow the lawn again. It was a poor choice of a day (95 degree Fahrenheit heat) and I had postponed it too long, so the mower kept getting gummed up with all the long grass. About halfway through the torture my daughter came out with a glass of water for me. I gratefully sat myself down on one of the many rocks in our yard and guzzled the water. As I was catching my breath I looked down and saw what appeared to be a four-leaf clover. I picked it and handed it to my daughter – who was very excited and took some photos (as you can see above). I don’t believe it has brought us a rash of good luck (especially since I don’t think it’s a clover, but actually an Oxalis), but it was definitely an exciting moment for my daughter. It made me think that sometimes we miss out on joyful moments because we are simply too busy. Perhaps we should slow down a bit and show a little more gratitude for the amazing blessings our Father in Heaven sends us each day. Yesterday I came across a great video encouraging us to do just that. Hello brothers and sisters. My topic today is staying true to the faith of our forefathers. I am going to start by talking about honeybees, but not just any honeybees ­ Japanese honeybees. Japanese honeybees spend their days hard at work. They build a home, make honey, and care for their cute little larvae ­ just like us! The problem arrives when a giant Asian hornet arrives. The hornet scout enters the beehive with plans to spray it with pheremones so that the rest of the giant hornets know where to attack. It only takes a few dozen giant hornets to destroy a hive of 10,000 honeybees. But the Japanese honeybees have a plan. Once the hornet enters the hive they signal to each other their plan of attack. All at once they swarm the giant hornet, trapping it in a ball of hundreds of honeybees. The hornet’s exoskeleton is too thick for the honeybee stingers to penetrate. So instead they wiggle! As they vibrate faster and faster the temperature at the center of the ball of bees spikes. They raise the temperature to 117 degrees Fahrenheit because they know that giant hornets can’t withstand that temperature. The hornet is roasted alive by the honeybees and it is never able to escape and the secret of the honeybee hive’s location is protected. This plan does involve sacrifice. Since Japanese honeybees can only withstand temperatures of 118 degrees Fahrenheit, each attack usually results in a handful of honeybee deaths. Those brave honeybees are willing to sacrifice everything to protect their families. I want each of you to think of someone you really admire. Think of a quality that the person has that you would like to have. Take a few seconds to think of what sacrifices you would be willing to make in order to gain that quality. I know that we can each be better if we follow the examples of those who have gone before. We should remember their sacrifices and try to be a little better. The Megalodon was an amazing predator. A 60-foot shark with teeth over 7 inches long. It ruled the seas for 20 million years. I love collecting Megalodon teeth. Recently I picked one up that is over four inches long. It’s not perfect – it has few serrations and part of one side was broken off at some point. It’s hard to dwell on the imperfections considering how incredible it is to simply look at and to hold in your hand. I decided to make a stand for it using a fossilized whale vertebra. I carefully carved out a chunk of the vertebra and set the tooth in it. It now looks as though the Megalodon lost its tooth while taking a bite out of the whale. Besides the fact that I think it looks pretty cool, mounting the tooth this way hides the imperfections and helps the viewer to imagine the sheer power the Megalodon had. As I was working on this mount a few weeks ago I started thinking about fathers and how they are a bit like this tooth. My dad in particular is pretty amazing. He would be the first to tell you that he isn’t perfect. If he’s anything like me, then I’m sure he’s harder on himself than anyone else and has a running list of character flaws he’d like to change. But since he’s my dad I don’t notice the minor flaws. To me he’s simply incredible. Having him as my dad showed me all the wonderful things about him and made it hard to focus on anything else. As far back as I can remember I’ve always wanted to be just like him. I remember staying up late on Saturday nights just long enough to listen to the Doctor Who theme song (before falling asleep on the floor) because I wanted to be with my dad. He spent countless hours helping me with math homework, which I knew I had to learn well since I wanted to be a physicist (like him) when I was in kindergarten. We geeked out at museums and he showed me the best way to shock people using the plasma globe at the planetarium. So to all you fathers out there – and to my dad in particular – thank you for being so incredible in the eyes of your children. I wish you could see yourself the way I see you. Don’t be so hard on yourselves for not being perfect, just be the epic Megalodon you truly are – and have that second helping of pie, you deserve it! DNA is a pretty amazing molecule. Even though the strands are so tiny that 5,000 of them laying side by side would only be the width of a human hair, DNA contains an incredible amount of information. It encodes all the information necessary for your body to look and function the way it does. DNA is such a compact way of storing information that scientists have found a way to create “DNA hard drives” to store digital data. Besides the vast amount of information stored within DNA, I find it amazing that DNA can survive the vicious daily beating that it receives. Each day the DNA in each of our cells will be damaged up to one million times – and yet most of that damage is fixed by an amazing cellular repair system that operates without a single conscious thought from us. Now most of the time we are happy to have an organism’s DNA repaired and kept just the way it is, but sometimes it’s nice to modify it. Life saving insulin for diabetics used to be extracted from pig pancreas, but it is now produced by genetically modified bacteria. Until the late 1980’s cheese was made by extracting an enzyme from calf stomachs, but that same enzyme is now mass produced by genetically modified microbes. Genetically modified Glo-fish are now available at pet stores. Genetic modifications can be used to add β-carotene to rice, create edible vaccines in bananas, or to reduce the amount of cancer-causing acrylamide in potatoes. Now I’m not here to talk about whether genetic engineering is a good idea or not, but I think everyone agrees that it is incredible that scientists have the power to make genetic modifications. And yet, that power is nothing compared to the power that mothers have to change lives. I guess you could call them genetic mom-ifications [although that sounded way cooler in my head]. Since it is Mother’s Day, I’d like to talk about some of the women who have changed my life forever. There is no way to discuss all of the ways that they have affected me, so I’ve chosen to focus on some small things that have had important consequences in my life. Growing up, every year my Grandma Cross would call me on my birthday. She would always start by singing to me. As a teenager I would roll my eyes and pretend that it was embarrassing, but to this day I get a little choked up just thinking about it. The simple fact that she remembered my birthday and took the time to call and talk to me made me feel important. It still serves as a reminder to me that there are people out there who know my name and care about me as an individual. When I was serving a mission in South Texas my Grandma Jones found out that my companion’s family wasn’t very supportive of him. She would send amazing packages that somehow defied the laws of physics by containing more items packed in there than was physically possible. And every time I’d open one of those boxes I would find that half of the goodies were for my companion. The first time it happened he couldn’t believe it. He ended up writing letters to her each week because he was so grateful. Now my companion and I didn’t always get along, mostly because I was young and foolish [I’ve solved half that problem, as I am no longer quite so young]. At times we would argue. But after that first package arrived things changed. When I would get upset and try to start and argument I could see him about to say something back, but he would get a look on his face and then he would suddenly stop. This would defuse the situation as I found that it was very hard to fight when you are the only person arguing. It was as though he would look at me and think, “This guy is a dork, but his grandma is so nice that I’m going to treat him with kindness. Not because he deserves it, but because she does.” I’ve tried to apply this in my own life. I’m far from perfect at it, but when I get upset I try to stop and think that even if the person in front of me deserves my anger, would I react differently if their mother or grandmother was standing next to them? What if their Savior was by their side? Would I bite my tongue and let go of my anger for His sake? My mother had an impact on my life daily. Sometimes it was with things that seemed trivial at the time. For example, I remember a fourth grade project on volcanoes. I’m sure you’ve experienced this as a parent – “It’s due tomorrow?!? Why didn’t you tell me about it earlier.” On this particular occasion it was bedtime and suddenly I pulled out the paper about the project. My mom just sighed and we went to work. I remember that it seemed to take hours. At one point I went into the bathroom and splashed cold water on my face because I had seen in the movies that that’s what you were supposed to do when you were working on a late night project. I’m amazed my mom didn’t groan when I came back to the table, no less tired, but with a damp shirt and a confused expression on my face. I didn’t realize it at the time since I didn’t grasp the fact that my mom had her own life and probably had hundreds of things she would rather do than work on a late night project with me. But she sat next to me and helped me finish it. She taught me that life is tough, but that just means you have to buckle down and get to work. I’ve tried to teach that same lesson to my kids. Mikayla and Natalia are currently testing for their 1st degree black belts and as part of the test they have to run three miles in 27 minutes. This is not an easy task, but I know they can do it. Whenever possible I go out there and run with them, even though before this I don’t think I’ve ever run three miles in my entire life. I like to think that my presence and support helps them to run faster, even if it’s just to be ahead of me and out of the splash zone in case I throw up. My lovely wife – the mother of our three children – is an amazing example to me. She is the funniest person I have ever met and she has helped me to learn that life is easier to cope with when you have a sense of humor. You wouldn’t know it by looking at her beautiful smiling face now, but our daughter Mikayla was not an easy baby. In fact she was a bit of a shrieking terror for the first few months of her life. Generally she would fall asleep screaming and then she would wake up screaming. I was in my first semester of graduate school, trying to balance a full load of graduate courses, acting as a teaching assistant and doing organometallic research with a very demanding boss. Lara was trying to recover from a C-section while dealing with a tiny, yet very demanding infant. We were a mess. We were both exhausted all the time – physically, emotionally and mentally drained. I remember one night we were trying to do the bills and neither of us could add two numbers together. On another night we had finally gotten Mikayla to sleep and we were so excited to finally go to bed ourselves when suddenly she woke up and began to wail. We both laid in bed for a few seconds before Lara said, “You know, she’s the best baby I’ve ever had.” We both began to laugh hysterically, which made Mikayla cry even harder, which made us laugh even harder. I’m sure our neighbors thought we were insane, which we probably were. We made it through those trying months, thanks in large part to Lara’s sense of humor. We’ve had some very tough times since then, but my wife has taught me that sometimes your only options are to laugh or cry – and it’s a lot more fun to laugh. So on this Mother’s Day, thank you to all the mothers who have made such a difference in my life and in the lives of every man, woman and child on this earth. I echo President Russell M. Nelson’s words, “The culminating act of all creation was the creation of woman!” Mother’s Day only comes around once a year, but your acts of love, devotion, and sacrifice will be remembered and cherished for all eternity. I have always loved Pop Rocks. There’s something magical about the way these unassuming little crystals of candy suddenly burst into activity in your mouth. I love the sound and feeling as they pop and the sweet enjoyment of the candy. My daughter, Natalia, loves bedtime stories. Each night we read together and it could be anything from a Nancy Drew mystery to “The Elements” by Theo Gray. Tonight she decided that she’d like to read some poetry. So we pulled out a book on poetry and read through half a dozen poems and talked a bit about each. The last one we read was “The House by the Side of the Road” by Sam Walter Foss. It’s a great poem with a wonderful message. I remember President Hinckley quoting it several times. It made me think of Pop Rocks. Pop Rocks really don’t look like much. They just sit there – tiny crystals of sugar in a pouch. But when you need them they suddenly spring to life, releasing miniature explosions of carbon dioxide. They have so much to give, even though they may not be very flashy. I hope to be a bit more like Pop Rocks, a bit more of a friend to man. I have met so many people who lead lives of quiet goodness, never asking for fame or fortune, content to serve without recognition. They do not judge others, yet they rejoice with them and they mourn with them. Although they are unassuming in nature, they spring into action when they sense a need. They explode with power when they see a chance to serve their fellow man. The photo above shows some tiny metal shavings attached to picture. The metal shavings aren’t terribly impressive, but what is amazing is that they were shaved from a small pin that was once part of the Apollo 11 Command Module – the same one that first took men to the moon. It’s amazing to think where that bit of metal has been. It makes me think a bit about sharing the gospel. I know it sounds weird, but hear me out. The metal shavings don’t look like much, but they are part of something much larger, something that changed human history – a man on the moon! We each have the opportunity to share the gospel with those around us. Sometimes we worry that our words and efforts are too small to be noticed or that people won’t take the gospel seriously because our simple words can’t even begin to describe the wonder that we feel inside. And it’s true that our words can’t fully describe the full majesty of the gospel of Jesus Christ, but that’s okay. When we share our testimonies of Jesus Christ those who are truly open to hearing His gospel will recognize our words for what they are – small and simple expressions of something so much larger. They will realize that the message of Christ’s atonement and resurrection truly has changed the history and fate of mankind for all eternity. And hopefully they will wish to join with us as we spread His word.